GOES-16 IFR Probabilities can now be displayed in AWIPS. This site has included the product for several months now. The imagery above, however, is from AWIPS, showing a toggle between Visible GOES-16 Imagery (with and without observations of ceiling heights and visibilities), MVFR (Marginal Visible Flight Rules) Probabilities, IFR (Instrument Flight Rules) Probabilities and LIFR (Low Instrument Flight Rules) Probabilities. GOES-16 IFR Probability fields are Bayesian and have been trained using about 2 months’ worth of GOES-16 Data. The LDM data feed will be providing data once GOES-16 Data are flowing again, sometime between 14 December and 20 December, when GOES-16 is on station at 75.2 º W Longitude. Dense Fog covered parts of Florida early on 30 November, and the animated GOES-16 IFR Probability field, above, shows the benefit of GOES-16’s routine 5-minute temporal cadence: the motion of the fog field is well-captured, and it’s straightforward to use the field to estimate the onset of IFR conditions. 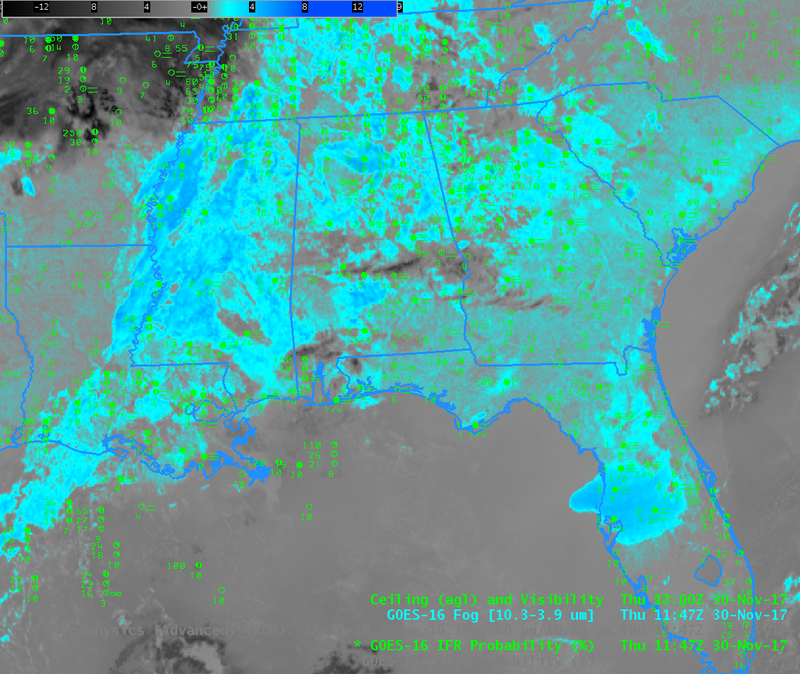 The Advanced Nigthtime Microphysics RGB for the same time period is shown below, and that product does not well indicate the widespread nature of the reduced ceilings and visibilities over northern Florida. Dense Fog Advisories were widespread over the southeastern US on the morning of 30 November, as shown by the screen capture above, from 1148 UTC 30 November. The toggle below shows IFR Probabilities and the Advanced Microphysics RGB for 1147 UTC on 30 November. The 10.3 µm – 3.9 µm Brightness Temperature Difference (BTD) for the same time shown at the bottom. Evidence of multiple cloud decks is apparent in the image. Such mid- and high-level clouds result in an ambiguous signal as far as fog detection goes in both the BTD and in the RGB. IFR Probabilities give a consistent signal in those regions that relies on Rapid Refresh Model output suggesting low-level saturation is present. This entry was posted in Deep South, GOES-16 on November 30, 2017 by Scott Lindstrom. 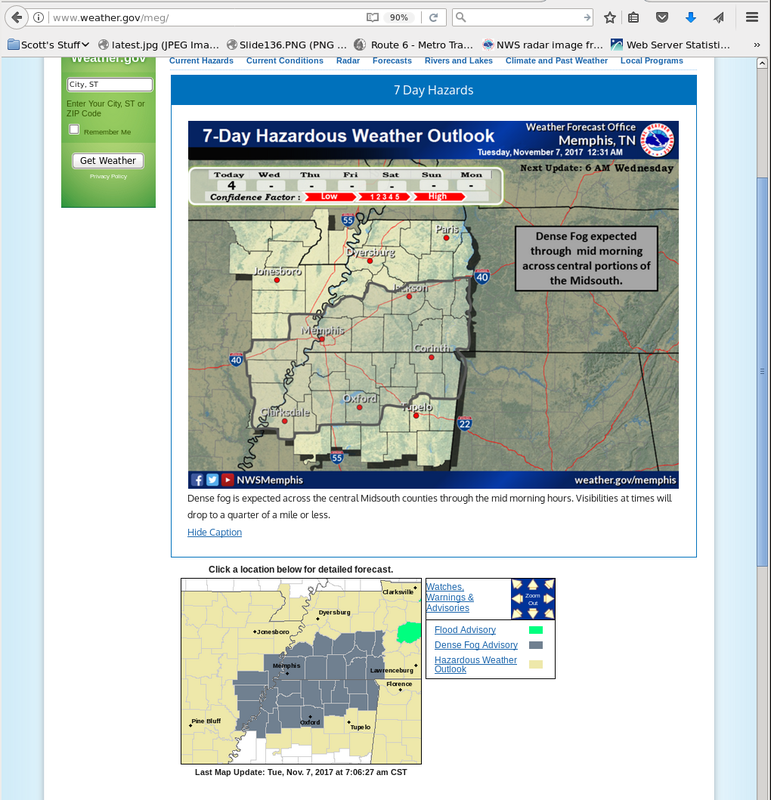 Dense Fog Advisories were issued over Memphis and adjacent portions of the mid-south on Tuesday morning, 7 November. 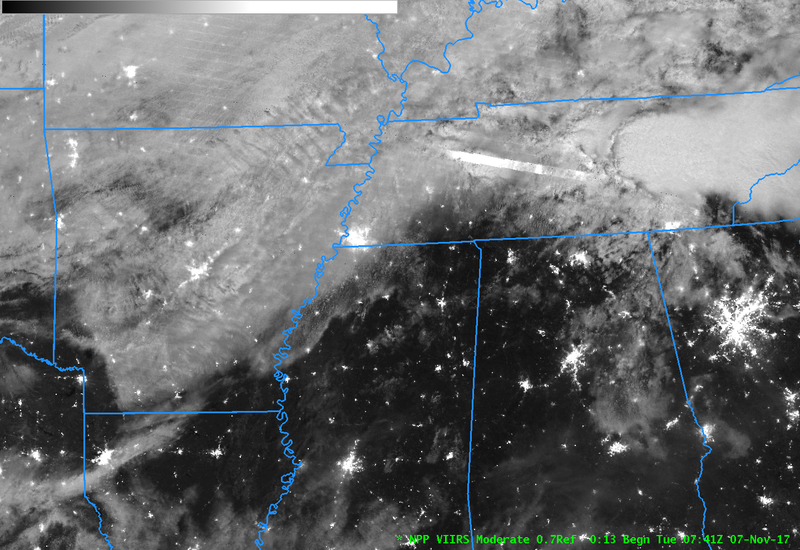 (Click here for a 1230 UTC screen capture from the Memphis National Weather Service webpage). The Advisory text is at the bottom of the post. GOES-R IFR Probabilities are computed using Legacy (Operational) GOES (GOES-13 and GOES-15) and Rapid Refresh model information; Preliminary IFR Probability fields computed with GOES-16 data are available here. IFR Probability fields based on GOES-16 will be available via LDM Request when GOES-16 becomes operational as GOES-East (currently scheduled for some time between 11 and 20 December 2017). The animation above shows the GOES-16 Brightness Temperature Difference Product (at every 10 minutes, rather than the typical 5-minute temporal cadence of GOES-16 over the continental US) during the night on 7 November. In the default color enhancement shown, clouds made up of water droplets are show up as cyan and blue whereas higher clouds are black. Note also the effects of increasing solar reflectance at the end of the animation: the brightness temperature difference is switching sign as increasing amounts of 3.9 µm radiation are reflected off the clouds. It could be difficult to use the animation above, alone, to heighten situational awareness of a developing region of fog because of the confounding effects of higher clouds. Additionally, infrared satellite imagery is challenged to detect cloud thickness: are the stratus clouds detected (cyan/blue in the enhancement) mid-level, low-level or both? IFR Probability fields can screen out regions of mid-level stratus, regions that are not so important from the point of view of transportation. This is because Rapid Refresh Model output is used as a predictor in the statistical model underlying IFR Probability fields. If the Rapid Refresh Fields do not show low-level near-saturation, the IFR Conditions are less likely. Consider, for example, the animation below of IFR Probability fields computed for GOES-13 data. At the beginning of the animation, the fields clearly distinguish between regions where dense fog is occurring near Memphis, and where mid-level stratus is more common (over northern Mississippi). As dawn approaches, reports of fog become more widespread over Mississippi — but the product has given a timely alert to how conditions might differ over a short region that was not possible with the single brightness temperature difference product alone. GOES-R IFR Probabilities are available via an LDM feed to National Weather Service Offices. At present, IFR/Low IFR and Marginal IFR Probabilities (and Cloud Thickness) fields that are sent are those created by the operational GOES-East Satellite, GOES-13. IFR Probability Products based on GOES-16 are being produced now, however, and are available here. The short animation below shows a behavior similar to the product based on GOES-13, but GOES-16 has far better temporal and spatial resolution! Click here for a toggle between GOES-13 IFR Probabilities, GOES-16 Brightness Temperature Difference Fields, and GOES-16 IFR Probabilities at 0715 UTC. When GOES-16 is operational as GOES-East, currently scheduled to occur between 11 and 20 December 2017, the LDM feed will supply GOES-East IFR Probabilities computed with GOES-16 data. Suomi NPP flew over the region at 0740 UTC on 7 November, and there was ample illumination to see the clouds. Multiple cloud decks and levels are apparent below. * VISIBILITY…Less than one-half mile. * TIMING…Through 9 AM CST Tuesday. become difficult due to limited visibilities. This entry was posted in Deep South, GOES-16 on November 7, 2017 by Scott Lindstrom.